Black Cherry Berry is unique combination of berry and wild cherry flavors. Here at Celestial Seasonings, we change to keep up with the times. This transformation of Wild Forest Blackberry is our latest evolution. Our new Wild Cherry Blackberry Herb Tea contains a lot more berry flavor for a fuller taste of fresh berries. We also added a dab of all-natural cherry flavor for an exciting wild cherry highlight… fun! Brew yourself a mug of Wild Cherry Blackberry and set its fresh cherry aroma free. This unique combination of betty and wild cherry flavors is dramatically better, still caffeine-free and tastes great hot or iced. Recommended Use: For a rich, robust cup of tea, steep 1 tea bag in 8 ounces of boiling water for 4 to 6 minutes. For a special treat, add sweetener and milk or cream. Or try your tea iced. Pour 4 ounces of boiling water over 2 tea bags. Steep for 4 minutes. Sweeten if desired, then pour over a tall glass of ice. Top with milk and indulge. 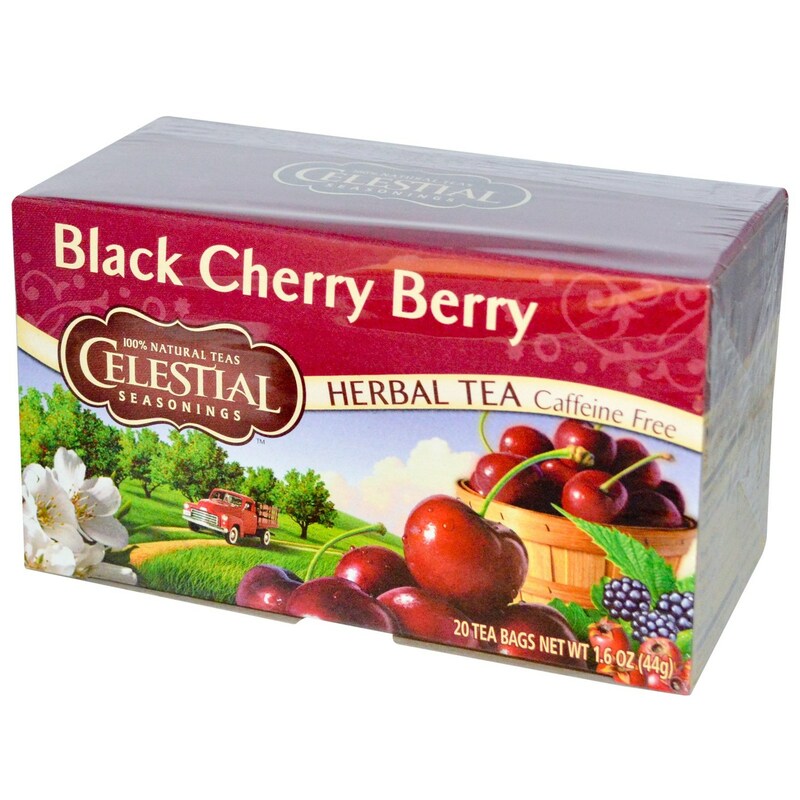 The customer reviews posted below are based on individual consumer experiences and may NOT necessarily represent what expected results will be from using or taking Celestial Seasonings Herbal Tea Black Cherry - 20 Bags. These results may not be typical and you should not necessarily expect to receive the same results. Actual results may vary. Great taste. It's not overly sweet or bitter. I enjoy it. A tea delight, I confess I'm a fan of almost everyone of this brand, but this is one of the favorites. 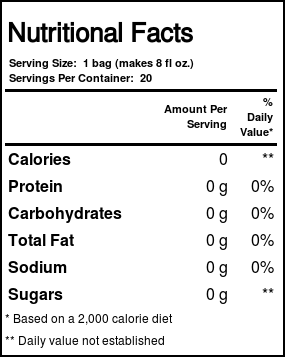 Taste delicious smooth and sweet, and does not need sweetening and is without caffeine! This has become one of my favorite teas. Great tea. Wonderful cherry flavor! 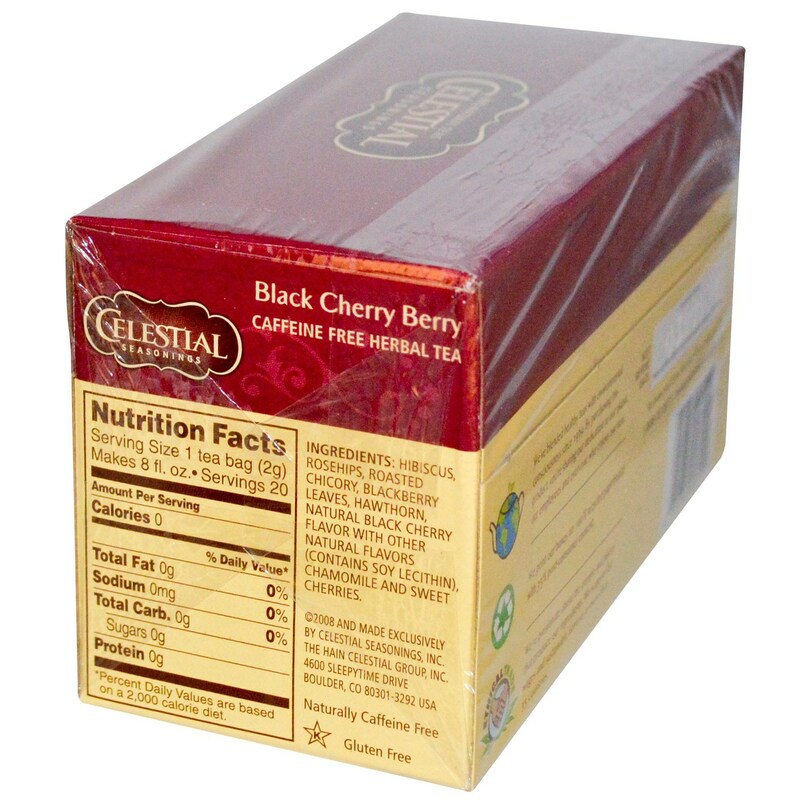 Entire family love this black cherry tea. Not only does it taste delicious but it also relax you. I drink at least 2 cups a day with honey. The cherry berry is really real... you can taste it! yummy for my tummy, soothing too.